Alice Somerville's inheritance lies six feet under in a Highland peat bog - a pair of valuable vintage motorbikes buried by her grandfather at the end of World War II. But when Alice finally organises their recovery, she finds an unwelcome surprise -a body with a pair of bullet holes . . . and Nike trainers. DCI Karen Pirie of Police Scotland's Historic Cases Unit is called in to unravel a case where nothing is quite as it seems. Meanwhile an overheard conversation in a cafe draws Karen to the heart of a murder she thought she'd already prevented. As Karen gets closer to the several truths, it becomes clear that not everyone shares her desire for justice. Or even the idea of what justice is. Back in the 'Golden Age' of Detective Fiction, from the interwar period and running for a while afterwards, four woman were tabbed as the 'Queens of Crime': Agatha Christie, Ngaio Marsh, Margery Allingham, and Dorothy Sayers. They weren't the only terrific crime writers from that era, but they are renowned globally as legends of the popular mystery genre. Choosing modern-day equivalents would provoke plenty of debate, but one name is an automatic choice: Val McDermid. The legendary Scottish crime writer has been entertaining readers for three decades, and even more impressively, continues to push boundaries and raise the bar, rather than resting on her laurels or slipping into obvious formula. Her most recent books, OUT OF BOUNDS and INSIDIOUS INTENT, were shortlisted for major crime awards (the latter was among my very my top reads of 2017). Her fifth Karen Pirie novel sees the head of the Historic Cases Unit challenged on several fronts. Her and her cold case offsider 'the Mint' are both still adjusting to the absence of their colleague, Pirie's lover, who came to a violent end. A new team member who seems far too close to Pirie's new boss is thrust upon them as they chase down a new lead in a string of historic rapes. When a body emerges from a Highlands peat bog thanks to a couple digging for wartime loot, Pirie and her team are called into action. At the same time an overhead cafe conversation creates all sorts of further problems. This is a smooth, engaging read. I really enjoyed the way McDermid took readers into the Highlands landscapes, and brought in some of the wartime history. The narrative dips into the past at times, adding tension and delivering fascinating tales rather than any jarring that can occur in lesser hands. Pirie may have begun as a secondary character in the earliest books (a little like Tito Ihaka in Paul Thomas' award-winning tales, who likewise was never meant to be the star), but she's now front and centre, and a terrific character who's easy to follow. Someone who doesn't see the cold cases unit as a dead-end role; instead Pirie genuinely cares for the families and forgotten victims, working diligently even in the face of problematic office politics and a variety of challenging people. 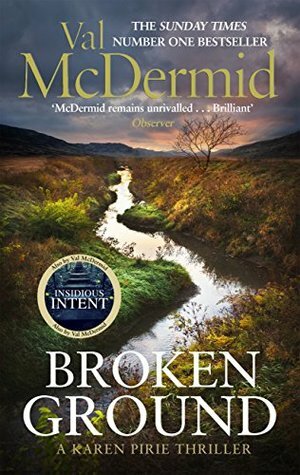 There's an authenticity to the characters, and touches of freshness in the choices McDermid makes - not overt or over-the-top in a 'look at me, being unique and different' way, instead really genuine and fitting. Deftly drawn characters populate an absorbing tale with plenty of humanity among the dark deeds. Overall BROKEN GROUND is a really good read, and another jewel in the Queen’s crown.